Do you struggle with the task of “being creative”? Do you find yourself wishing you could be more creative in a structured way? 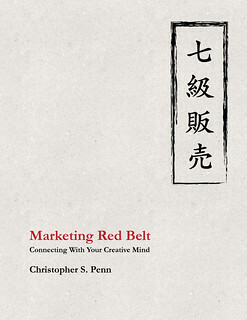 Marketing Red Belt: Connecting You With Your Creative Mind looks at what makes up creativity and how to generate more of it in your life, work, and business. It’s intended for marketers and business folks who are faced with increasing creative demands but don’t regard themselves as “creatives”, didn’t go to art school, and run into writer’s block/creator’s block more frequently than they’d like. If you perceive yourself as being “uncreative” or face long dry streaks of creativity, then Marketing Red Belt is for you. Marketing Red Belt examines how creativity works, from early research to the latest findings in neuroscience. From there, you’ll learn 5 practical idea-generating techniques, a framework to help set the stage to unlock your creativity, ways to prepare your mind to be creative, and even a way to measure your creativity for the purposes of improving it. Marketing Red Belt: Connecting With Your Creative Mind in Kindle, iBooks, and PDF formats as one ZIP file. It’s also available on Amazon.com if you’d prefer to purchase there.